A quick post while I get all the power data, maps and stuff together. I set a new PR today of 5:25, unofficially. My previous best was 5:40 set in 2007. Stay tuned for a full ride report. 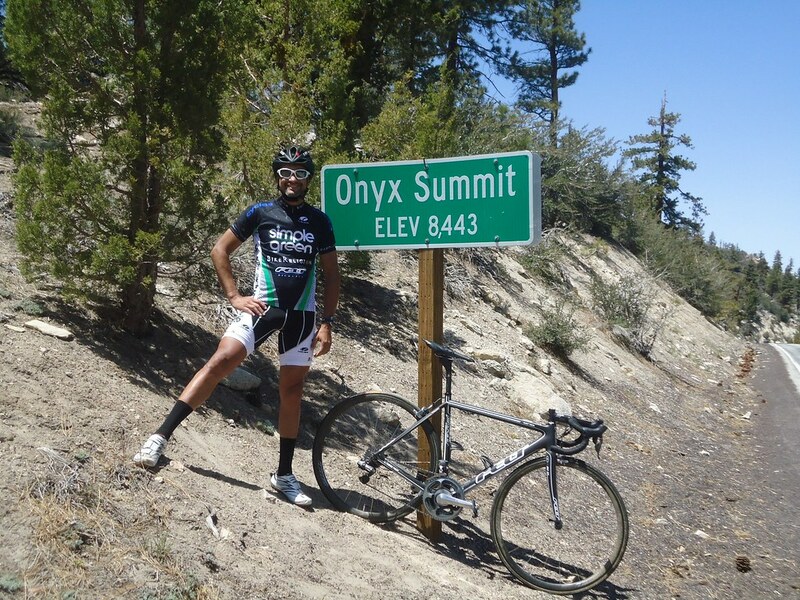 George “Red-Eyed Vireo” Vargas sets new PR on 2011 Breathless Agony of 5:25, unofficially on his 2011 Felt F1. with Di2 and SRM. This entry was posted in 2011 Race Reports, breathless agony, personal records by REV Cycling Directeur Sportif. Bookmark the permalink. I was looking for a Bike Religion kit (for you). But I did see you go by. You passed me on Oak Glen and you were flying. One of the guys riding with me said,”I wonder how long he can keep that pace”. Obviously all the way! Great job and you’re getting close to Scott’s record. Was I sucking the wheel of three other riders when I passed you? Because if I was your friend was right in wondering how long I could hold that pace. I got dropped by those guys – two are pro cyclists (one road the other MTB). I got on their wheel as they flew by me and was only able to stay on it for about 6 minutes before they popped me off. It then took me another 10 minutes to regroup lol! and get back in MY OWN groove. They both went sub 5 hours. Scott’s record is untouchable by this mere mortal! How did you fair out there today? The weather was perfect!! I’d like a full description of your new bike build! I was just thinking the three of us should join forces and really crush this thing next year. Matt you’ve already confided in me that Road Races may not be your thing. And Ben you are strong beyond belief. What do you guys say? I was alone a few times and that hurt my chances. I was fit but had cramping issues based on the nutrition provided at the event. George- What events are on your calendar this summer? I’m doing Climb to Kaiser and Everest Challenge. May also throw in a double century into the mix in July/August if I can find one. Also, I am hoping to do the Onion Valley/Whitney Portal/Horseshoe triple this summer, which I was inspired to do after seeing your post last year. Any chance you are going to do this again this year? Good stuff George! It must have been that sweet new F1! JK, you’ve been killing it during training. That week of the Mount Laguna Classic was an insane block of training. Keep it up! Thank you for checking in! Yeah have been working hard …and getting colds urg! But hopefully I can keep the momentum going. That new F1 IS one sweet ride. It is harsher than my R3SL but it’s stiff as heck! Thank you for acknowledging my hard work. I’m just trying to keep up with you 😉 Are you doing any climbing or century events this year? Or are you focused on Road Races and Crits? Yea, I don’t keep up with many blogs. Maybe less than a handful. Yours is uber informative with the mixture of ride reports, training, product reviews, etc, and it’s my go to blog! Maybe it grasps my attention because I feel like I relate; average guy, really loves all aspects of cycling (the sport, physical aspect, technology, data, etc), and dedicating oneself to training to really push himself. I really like my R3SL, but would like to try something new. I’ve got my eye on that new SuperSix Evo, but first a powermeter for the Cervelo! But yes, I have been focusing on what is my first racing season. I started with my first race earlier last month and it’s been so much fun I did a couple more soon after. I do miss the long grueling challenge of hard centuries though. I may do the TdFrancis rides this year if I do any. Any chance you’ll be doing any training on Palomar in the near future? I might be doing it frequently this month and the next in preparation for the Mt. Whitney Stage Race. I rode for a while with you on Alessandro and up OG. Thought I recognized you from the internet. I thought you were yelling at me when I saw your earbuds and realized you were just rocking out. Alessandro is the flat part before Jack Rabbit. Was trying to stay near the front so as to not get caught behind the group on Jack Rabbit. Wound up picking my through the peeps though. Wearing Velo Studio colors on a red white Colnago CX1. Times before on Oak Glen, I could find my rythmn, this time not so much. But, good ride none the less. Ah yes I remember you. Funny how we remember people’s bikes. I remember trying to motivate you up Oak Glen. Our pace seemed compatible. How did you end up? 5:48. PR. Had some cramping start on Damnation. By Angelus Oaks it was getting better but it kept me from putting power to the pedals. I’m still working out nutrition for longer rides. Had a good meal plan for the week prior, but didn’t have the meals I planned the two days before. My reserves depleted by Mill Creek. And if I’m on gels at 40 miles, I kinda knew my day was done. But, as always, it’s good to see so many good riders out there enjoying the day. With top notch support from Robert’s crew. I learn a lot from blogs like yours. Keep up the good work. George- good ride! I wish I’d been there. Maybe next year. Thank you! I felt good most of the day. A few cramps and a few lulls but overall good. I will posting my race report in the next day or so. The weather was perfect on Saturday!